December 31, 2016 December 30, 2016 Amanda B. At this time in the school year, I find that students start to get bored with centers that we have been using. We have a good rotation of literacy centers that we use regularly and we add seasonal centers to the mix occasionally. At this time of the school year, I find that students begin to feel bored with the centers that we have, so I set myself a goal of creating some new centers for the new year. This is a literacy pack that makes working on letters and sight words easy- it is low-prep, reusable and fun for students! 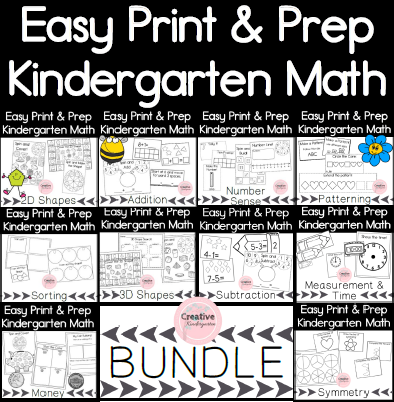 This set is designed to work with all students from the beginning of the year, until the end. It is also made with all the varying needs of kindergarten students in mind. From the students who are just learning to print their letters, to those writing full sentences. The easier activities can be used at the beginning of the school year, while some of the more advanced activities can be saved for later. It is meant to be versatile and meet many different needs. It can be used for assessment, in small groups, large groups or centers. 1. Pick a letter, write a word that begins with that letter, write a sentence with that word and illustrate the sentence. 2. Pick a letter and write as many words that you can that begin with that letter. 1. Pick a sight word, use it in a sentence and illustrate the sentence. 3. Pick a sentence starter (20 are provided), complete the sentence and illustrate it. 3. 20 sentence starter cards using only words on the pre-primer list. It can be used throughout the year, and will be something you come back to again and again! Next postWeekly Journal Writing FREEBIE!